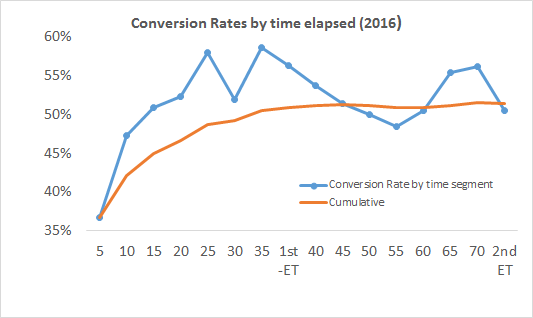 What is Expt Pts (Expected Points)? 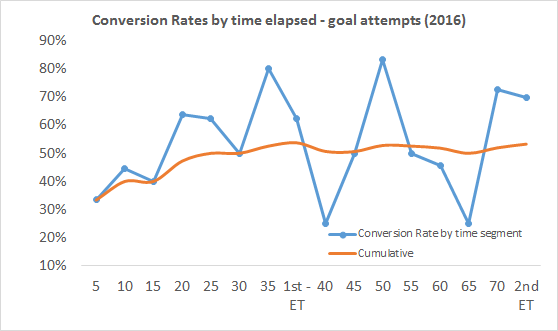 Expt Pts is very loosely aligned to Expected Goals (xG) in soccer. You take every shot and assign it a value linked to the likelihood of its success based on the observed historical averages. 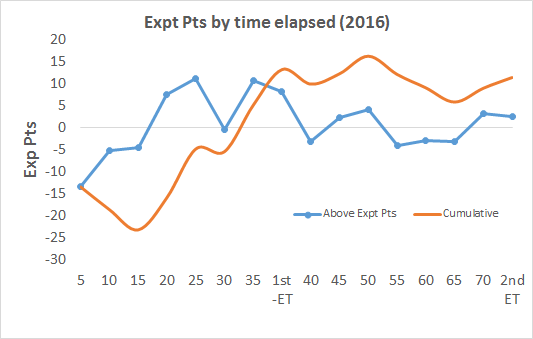 Before we set out I am acutely aware that Expected Points is not the answer to anything. It is a tool to quickly highlight if there might be issues. In its current form it is very raw. We know from other sports that the game state is very important (teams chasing a lead in soccer tend to have more shots for instance) whilst the quality of opposition can also be a factor (football outsider’s DVOA v VOA). As such the values herein will be referenced as “Raw Expt Pts”. Other variables need to be overlaid onto the raw averages, whilst tighter sectors also need to be worked upon, to elevate it from its raw state. Unlike soccer those working in the GAA do not have a company, such as Opta, collating shot location data – it has to be done manually. 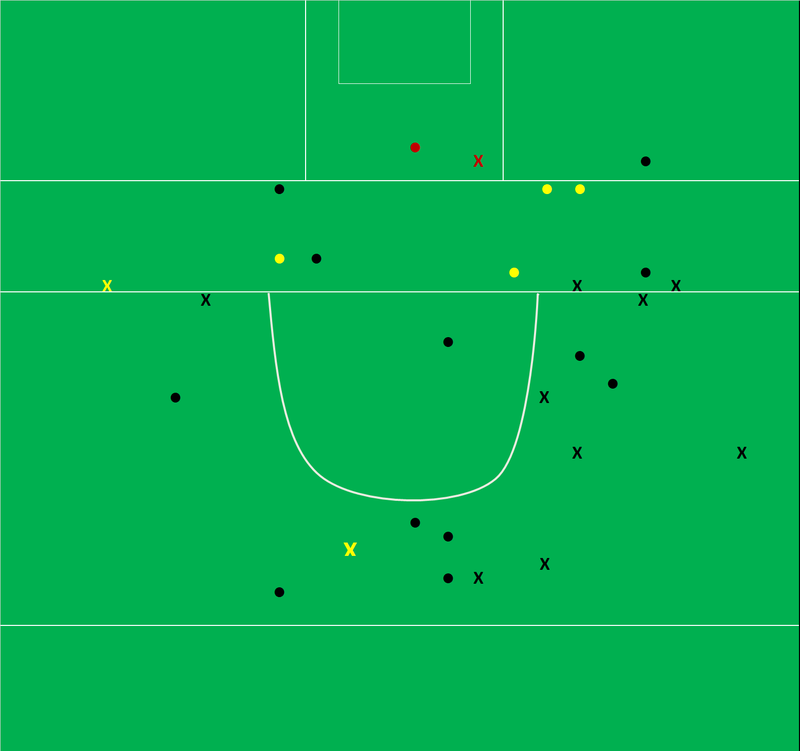 The area on the pitch from where shots emanate from is also much greater. 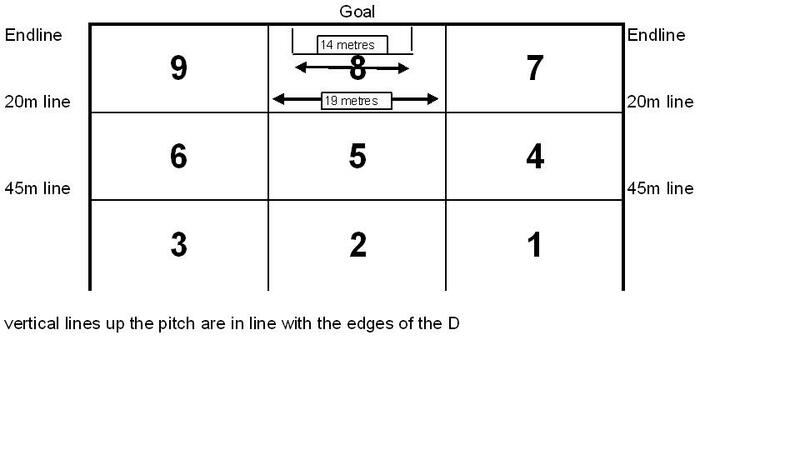 As well as shot location the type of shot is noted – 45, free, point attempt from play, sideline, penalty – as well as whether it was a point attempt or a shot on goal. So we end up with three questions that need to be accounted for on every shot – location (which is then converted into one of the above segments), type and whether it is a goal attempt. The type is fixed and whilst there is some subjectivity on the location generally speaking we have a lot of latitude given the larger segments we are working with. There is even less subjectivity on whether a player is going for goal though you will occasionally need to be a mind reader! Fine. 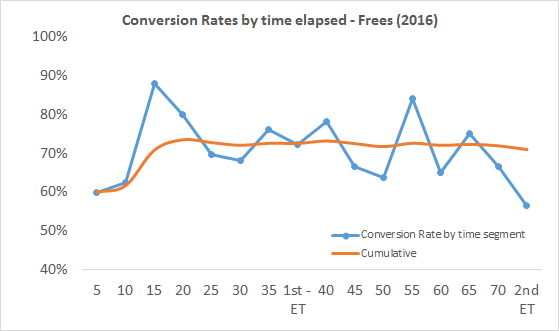 I have the above tracked for a game and realise its limitations – now what? Now you start to (a) produce data and (b) use it to review. 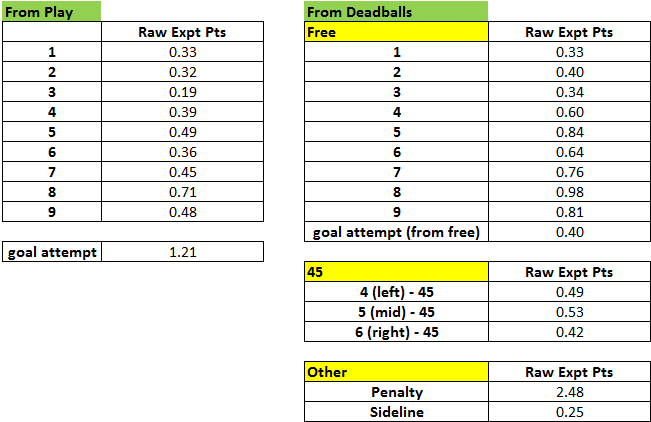 Below is the Raw Expt Pts return for every combo mentioned above (pitch position, shot type and goal attempt or not). Should you wish you can start to use these immediately as they are based on a dataset that comprises well in excess of 4,000 shots. 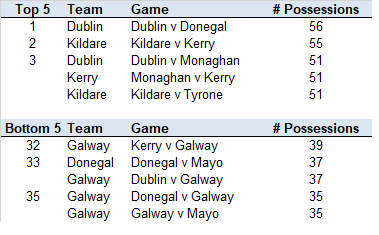 That dataset comprises entirely of intercounty Championship games but I have used the outcomes on league & club games as a starting point and taken the results with this in mind. Take a point attempt, from play, from sector 4. The Raw Expt Pts for every shot from this sector is 0.39. Every shot is thus expected to produce 0.39 points. Now we know the binary outcome for this shot is either a score (1) or not (0). 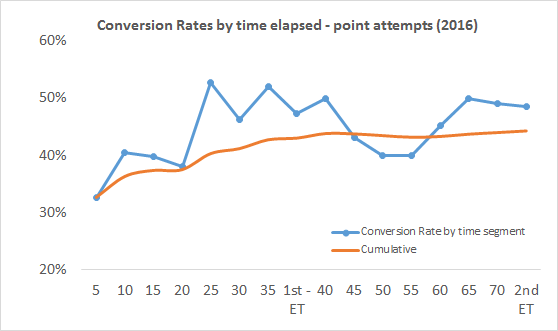 Thus if the shot is converted the Expt Pts outcome is 1 (scored 1 point) minus 0.39 (the expected value) for a return of +0.61 (1 -0.39 = 0.61). 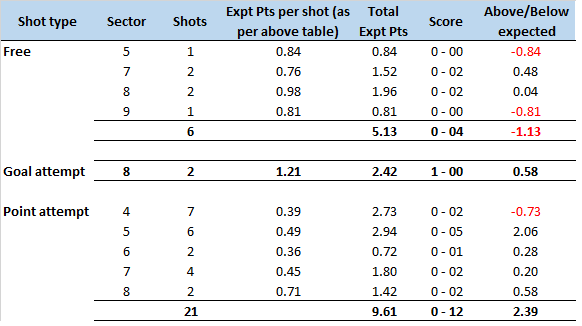 If the shot is missed, for whatever reason, the Expt Pts outcome is -0.39 (0 – 0.39 = -0.39). 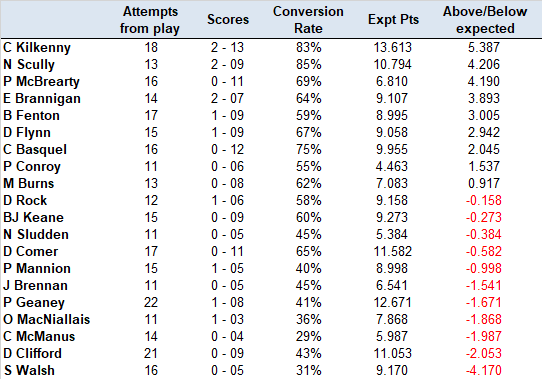 Do this for every shot using the appropriate “Raw Expt Pts” value. You can now add up an accurate, appropriately weighted, value for each shot. Below is the Mayo shot chart from the 2017 All Ireland defeat to Dublin. 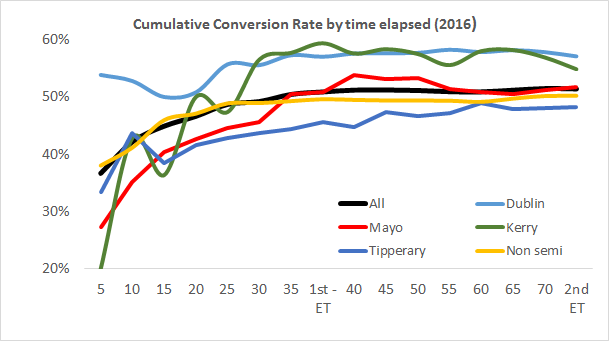 Mayo’s Raw Expt Pts come in at +1.84 which means that, at a macro level, they scored about two points more than they should have (were expected to) going on how often inter county teams historically converted those attempts. Their shooting was very good. Breaking the shooting down we can see that the “very good” shooting was not universal. Two goals attempts returning 1 – 00 is just above what is expected. 21 point attempts returning 0 – 12 (57%) with a +2.39 Expt Pts is exceptional … but the excellent shooting was restricted to the central Sector 5 channel. Deadballs were poor. 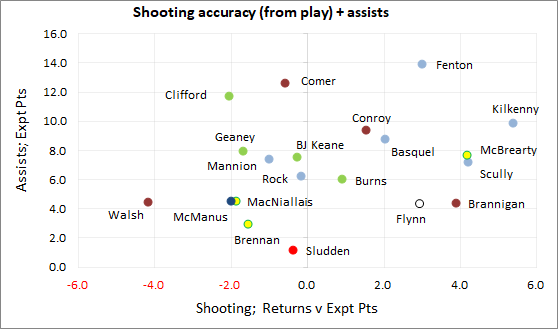 By using the Expt Pts – with all its inherent flaws – you can quickly highlight areas that need addressing (or alternatively you can get bland results across the board and move on to something other than shooting). Its real power comes in over longer timeframes where the returns from multiple games can be reviewed. Build upon the data and you can get a sense of the team’s relative strength/weaknesses/tendencies. Do it for the opposition and you start to build up a picture of the defence.